Makes my hair feel so incredibly soft and smooth with out feeling too greasy, just have to get past the smell. I love this product so much! I have very dry skin so it's a savior! I love the packaging as it's really efficient! Goo work The Ordinary! Nice, good quality Argan oil, generally pretty pleased with most of my items from the Ordinary. I get how some people may not like the smell, but I've always rather liked it, it is definitely strong. Awfully disappointed due to the smell. If you have ever had a turtle as a pet or been to a reptile house in a zoo, that is the exact smell. The other argan oil products have never had nay smell to them so either they were fake or this one is but if you want your kids or anyone to kiss you goodnight you will not want to use this product. The product is fine but I'm of the camp of the scent is a bit strong for my liking. I've used other argan oils that had a more neutral smell than I've experienced with this one. This is so oily that it should be used with regular hair products, and it can't be used solely. it's really good to use it on hair. Good product at a great price. I have used it on my face, hands and hair. Absorbs quickly without leaving an oily film. As to the complaints about odor, I disagree. The odor is similar to the other hypoallergenic, unperfumed products I have been using on my allergy-prone skin for years. Got this to condition my hair and it does the job. Smell is pretty strong out of the bottle but goes away by the time I've applied it. Bought this for a friend who tends to have dry flakey skin. I use and love the ordinary products and she has since bought them herself. I was hesitant to purchase this because of reviews of the smell and the price point. I just felt like it was too good to be true. I do agree the smell is a bit stronger than most. I did some research online on how to tell if argan oil is authentic and if processed to offer the best quality oil. The best test was a refrigerator test, where if authentic and good quality, it would solidify if left in the refrigerator for 24 hours. I did the test, and it solidified!!! Restored my faith in this oil and happily use it now. Very moisturizing and the smell does dissipate. By the way, when refrigerated the smell can be stronger which I also read is a good indication. So beware if you already don't like the smell. Awfull smell, makes me doubt whatâ€™s in the product as it has the same smell as olive oil. Made me break out like crazy even though argan oil has a 0 rating for comedogenic proprieties . I have to use it now for my hair but I donâ€™t stand the smell and I have to mix it with another cream that I use. I do not recommend unfortunately. Fabulous product. I have been using it for more than 6 months. Works better than the so called "Very best" on the market. I should know; I'm a consultant. Great product & wonderful price. I have given some to my friends & family. Using it on face, skin, hair & nails. No breakouts for anyone. Highly recommend! I use this on my face in the evening, sometimes through the day when I need extra moisturizing. It doesn't smell very good, kind of like black walnuts...but it does what it should. No breakouts, when using this light oil - good for adding moisture and a subtle glow to to dry skin. Can't beat the price! I love this product. I apply this on my wet hair after shower. This makes my hair is smooth and nice looking. Very recommend! Have only used it on my hair but it is great because I have really thick curly hair and it helps really define those curls. I've used a few Argan oil's and this is my least favourite. The smell is awful and I find it more oily on my face than others I've tried. You don't need much though, a little goes a long way. After straughtening, a little goes a long way. I have used on my skin a few times at night but I find it too heavy. Pretty good oil. I used it to make DIY products with. I love that Argan oil is multifunctional and has a comodenegic rating of 0 which is hydrating but wonâ€™t cause break outs! Just a few drops keeps my dry damaged hair smooth. It also sinks straight into my skin and leaves my face soft and glowing. Love it! I like this argan oil for when my skin is very dry. Also good for the nails and hair. The smell is nice, not too strong. Very affordable price. This is a great product at an amazing price point compared to what other skin care companies offer. Works as well as any other argan oil I've tried, and a great price. I will buy again for sure. I've been putting a drop on my cuticles day and night for two weeks and it's making a big difference. I like this product, it mixes well in my DIY serum. I also use it on my hair. Would recommend to a friend. This is a great product, it hydrates and strengthens your hair. In other words, its great for your hair. I will purchase again. This oil is wonderful, wonderful, wonderful. It moisturizers the face, hands, feet, knees, elbows...anywhere you have rough dry skin. It is amazing. It absorbs instantly and does not leave an oily/greasy film. I love this so much I apply it twice a day. You will too...once you try it. This smells awful, but that means it's 100% argan oil with no added fragrances. The smell doesn't linger on your hair for long. I like to apply it at night, then, by morning there's for sure no smell left. Love this product! Hydrates my skin perfectly and has a great price as well! Definitely would recommend! Less is more with this oil. I rub 4-5 drops in my palms and apply to wet hair evenly, then use other styling products. My hair likes it a lot. Taming the frizzys. In general it feels nourished, shiny and healthy. I also use it cocktailed in the palm with a finishing spray, gives my hair a natural oomph. 2-3 drops after moisturizing on face neck and declotte is more than enough for me. It's practice and trial and error using oils. My experience a little bit give great results. Very nice moisturizer but the smell is horrible - I keep using it to moisturise my skin but I always have to plug my nose and quickly apply something else on top of it to get rid of the smell. Best oil for my acne prone, sensitive skin. 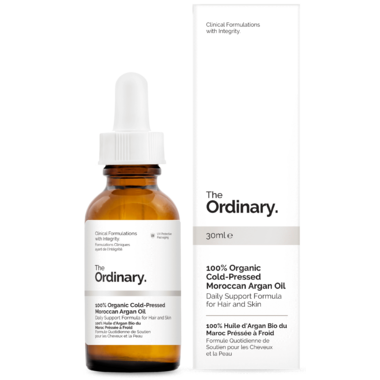 This oil applied every night after serums will moisturize my skin without making it too greasy or clogging my pores. When everthing else burns on application, this oil is gentle and nurturing. And the price can't be beat. I did my research and discovered that Argan oil is the best face oil for those with acne issues. This one is great, but it did cause me to breakout. I guess face oil is just not for those of us with oily skin. In this recent DEEP FREEZE I've been using this as my morning and evening moisturizer and it is working AMAZING. My skin has never felt softer and it's the middle of winter!!! I love how soft it makes my hair feel, however it smells AWFUL!! I added some essential oil to it to make the smell bearable. love it other than that though! I am using this oil instead of expensive moisturizers, and I love the results. Not greasy and very hydrating, great for winter. I am also saving a ton of money, so win win. I usually buy The Original's rosehip seed oil, but I bought this instead because that was out of stock! It's a good product, but I found it broke out my skin a little bit (then again, I have sensitive skin). Still great to use for hair. The smell doesn't bother me and it's quite mild. Overall this product is excellent. I used it for hair and face for 3 months and it has changed the texture of my skin. Fine lines and wrinkles are softened and my face looks hydrated. I wear it under makeup and it goes on so smooth. Wow!